Inside the buildable pink castle, the beautiful princess grooms and feeds her favorite horse. Hitch him up to the carriage for a ride in the countryside! Let your little princess build a world of her very own with 88 pretty LEGO pieces. Rebuild into a horse-training arena or bedroom. Includes a princess minifigure with a carrot and building instruction booklet full of inspirational ideas…. This toy costs approximately £6.99 (for the latest and best prices make sure you check our retailer list for the LEGO My First LEGO Princess 10656 above). 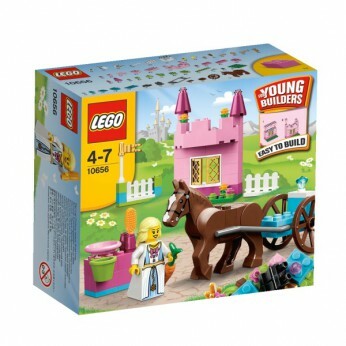 In our review of LEGO My First LEGO Princess 10656 we classed it as being suitable for ages 6 years, 7 years, 8 years, 9 years, over 10 years but recommend you check the manufacturer specific advice before purchasing.